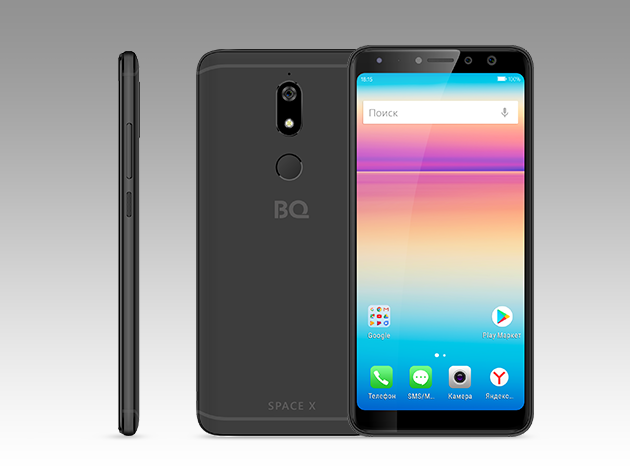 Model: The BQ Mobile Space X (BQ-5700L) smartphone was released in late 2017. The BQ-5700L Space X took the position of the flagship in its models line and is aimed at users who put increased demands on all these parameters. In addition, it claims a long battery life, a 20-megapixel front camera with an additional 8-megapixel module, a phase detection autofocus, a fingerprint scanner for unlocking, support for Face Unlock technology, and a vibrant display. The BQ BQ-5700L Space X picked up a trend with an extended display and reduced frames around it. Following expensive brand smartphones, this technology has become available in a more reasonable price segment. The design of the smartphone looks premium. It features a metal case. The outer surface is matte and not susceptible to smudging with fingerprints and does not slip out of the hands. The bottom row of touch buttons is moved to the interface. The upper and lower frame is narrow and the screen occupies almost the entire area of ​​the front panel, following the 2017 smartphone trend. The bottom houses the speaker grille and a micro USB connector, as well as the main microphone. There is an additional microphone for noise reduction in the main camera area. At the top end is an audio jack for headphones. As for the camera, there is one with a resolution of 16 megapixels and the second with a resolution of 20+8 megapixels. The front camera with 20 + 8 MP sensor supports background blur and face decoration. This approach is justified, given that very often a smartphone is used for self-portraits and the user is forced to use a camera with lower image quality. The 16 MP main camera works without any complaints. In daylight and at a sufficient level of illumination, phase autofocus works quickly. For hardware specification, it is powered by a rather low-end Qualcomm Snapdragon 430 with eight cores Cortex A-53, Adreno 505 graphics processor, 3 GB of RAM and 32 GB of internal storage. The storage can be expanded by up to 256 GB with a microSD card. Performance is sufficient for games with medium graphics applications. Just don’t expect this phone to handle all those graphic-hungry games properly. For display, a matrix with an aspect ratio of 18: 9 is established. It is an S-IPS matrix with a diagonal of 5.7 inch. The screen quality is excellent. It can be used for various groups of tasks, including reading and games. The illumination is uniform throughout the area, adaptive adjustment is supported. The touch layer recognizes up to 5 simultaneous touches. A battery with a capacity of 3.000 mAh makes autonomous work possible. It guarantees a whole working day of active operation. It lasts about 4.5 - 5 hours in games, 6 hours in movie playback. Unfortunately, fast charging is not supported. The BQ Mobile Space X is an affordable smartphone with all the latest features one would expect in a 2017 phone. It will be suitable for light users and its main competitor is the Xiaomi Redmi 5, which is also a great phone for its price. 93.33%: Indeed, this rating is very goodl There do not exist many notebook models, which are rated better.